Not a lot of people who read this blog know this about me, but I’ve been a musician most of my life. I never pursued it in any serious way, aside from playing in band in school and learning how to play the guitar. I also noodled around on several other instruments, including my sister’s clarinet, a neighbor’s violin, and the French horn owned by my middle school. Recently, I completed an online Introduction to Guitar course offered by Berklee College of Music through Coursera. I was rusty and thought I’d benefit from going back to the beginning, and I did. The instruction was excellent, and I learned things about music theory that I didn’t know. 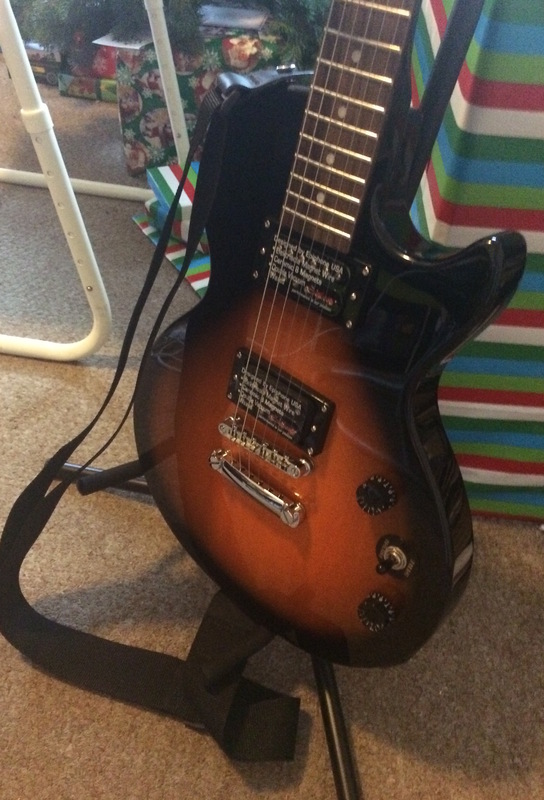 I received an electric guitar for Christmas. It was the fulfillment of a dream I’ve had since high school. At the time, they seemed so expensive and so outside the realm of anything I would ever be able to obtain that I gave up. You could say that music runs in my DNA. My father played drums in school, and my uncle still does. He’s been a lifelong professional musician, in fact. My grandfather played the trombone. My great-great-grandfather played the fiddle. My great-great-grandmother and her mother played the organ. Many generations back, I have an ancestor, a rifle-maker tired of paying high prices for gun locks from New York, who supposedly charmed a gun lock manufacturer out of his secrets by playing the violin. In times gone by, if you wanted music, especially on the American frontier, you needed to make it yourself. Willa Cather’s short story “A Wagner Matinee” has long been a favorite because I connect to it so deeply. I was, of course, lucky enough to grow up in a time when access to music was ubiquitous—through the radio, through music stores, through mixtapes made for friends. It wasn’t quite like today with access to new music on various streaming sites and YouTube, but it wasn’t hard to hear about new music. I can remember trying to make requests on the radio (they were ignored). I can remember taping music off the radio. I nearly wore out my copy of Bon Jovi’s Slippery When Wet when I was 15—until I discovered Led Zeppelin and left Bon Jovi in the dust. There was a period of time in the mid-1990’s when I listened to The Joshua Tree on a loop in my car. Around 2005, I think, I discovered Jeff Buckley. A few years later, Jack White. I can’t say I stay as current as I did when I was young, but I love discovering new artists, and still try to listen to new music. There was a time in my 30’s when I felt like I didn’t know anything about current music, and I admit it was a bit of a panic. I suddenly felt old. I was in college when grunge was popular. Nirvana broke my sophomore year. Pearl Jam even came to my university and gave a free or cheap concert (I can’t remember now). I didn’t go. Can you believe that? Big regret of mine. At the time, I didn’t think I liked them, really. In fact, if I have one regret, it’s that I didn’t go see as much live music as I should have. I saw some; I just didn’t take advantage of opportunities I had to see more. There really isn’t anything quite like seeing music live. I listened to so much music in high school and college that there are certain songs and albums I can hear that will take me right back to that time. I listened to a lot of things—hard rock, classical, big band swing, blues. Later on, I developed a fondness for old school country. I am a music lover and long time closet musician as well – I so appreciated your post and the walk down memory lane! What an intriguing post. The question, “Imagine you’ve met someone who has been severely cut off from the world, and you get to introduce this person to music. What would be the first recorded song you would play?” begs us to examine what we value, what reflects our passion, or how we think about the world. Nice choice by the way. I’ll have to give my choice more thought!! 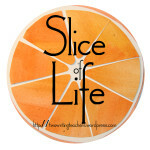 Lovely slice, today! I, of course, forgot Pink Floyd, so adding that to the playlist. I’ve been thinking about music quite a lot lately and will probably write a slice about it. I wish I were musically talented. I can’t even play the kazoo well! I’m thinking about the FB question, too. Sinatra popped into my mind first. My love of him has grown over time. Glad you got the guitar. Post a video of yourself playing! I should! I don’t have one (yet). There is an Eric Church song (Springsteen) with lyrics in the chorus that say “Funny how a melody sounds like a memory”. When I heard that song, I was struck by how true those words are. You know this, and I’m sure many others agree with us. Music holds many memories. It sure does. It’s probably second only to smell. My students were telling me the other day that there is a good reason for this: has something to do with where in the brain we process smells and and store memories. Wouldn’t surprise me if music were similar.